When I was in 4th or 5th grade, my art teacher gave me a copy of Squadron Supreme #12. Back then I devoured every comic I could get my hands on, so this being the final issue of a limited series I knew nothing about didn’t phase me — I dove right in. What I read was completely unexpected, and totally unlike any of the other superhero comics I’d read. The final issue (SPOILERS) is a knock-down, drag-out battle royale between former superhero teammates — all deeply flawed human beings, all relatable in their very human failings. And in that battle, some of the titular heroes get killed by people who used to be their friends, or at least their allies. And not “comic book killed,” just plain ol’ killed. My 8- or 9-year-old mind was blown. I’d never read a superhero comic where heroes fought each other for real before, and certainly never one where the marquee characters got killed (and didn’t come back). 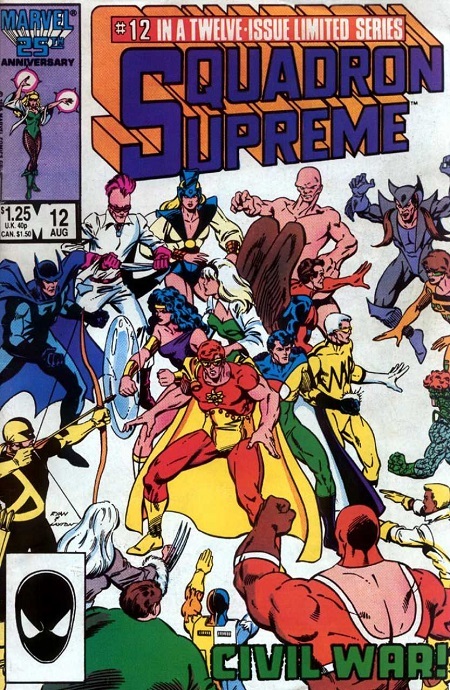 It stuck with me, and looking back on it I can see many threads connecting things I love as an adult with that issue of Squadron Supreme and its inversion of superhero tropes. A few years back I remember that issue, and wondered why I’d never finished the series. So I bought a TPB collecting the whole series — and it was amazing. And then I bought a second copy, one from the first printing that — per his last wishes — incorporated Squadron Supreme creator Mark Gruenwald‘s ashes into the ink, because how could I not? 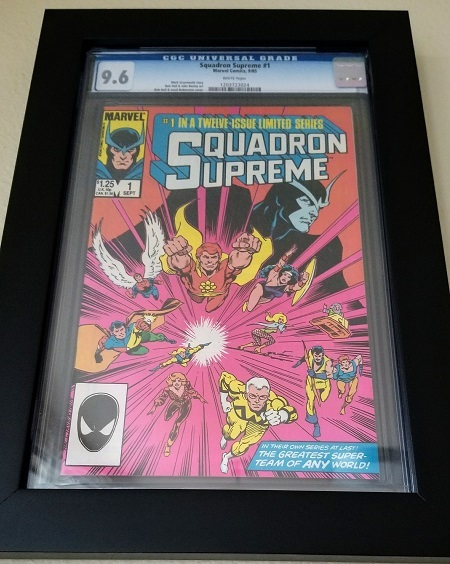 I also picked this up, a CGC-slabbed copy of issue #1, and added it to my wall of original art and other comics and RPG geekery. 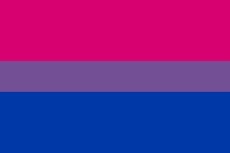 I love it, and every time I look up at it I wind up thinking about comics, and what I’m reading, and what I want to read next, and . . . If you’ve never checked out Squadron Supreme, I highly recommend it. There are a dearth of CGC slab frames with UV protection (which I consider a must-have for wall hanging anywhere near windows), but I love the ECC Frames basic model shown here. They’re not cheap, but I don’t frame many comics; it’s worth it.